Dr. Montessori knew the importance of children having a personal and sensorial experience with something as their introduction to new work or concepts. The opportunity to explore with their hands, accompanied by the gift of time for that exploration, creates a position of readiness that supports memory and understanding. 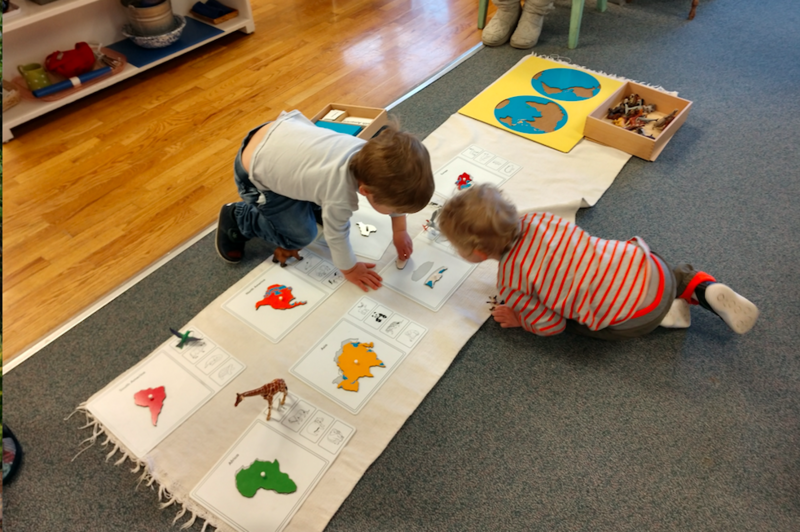 While this process is evident throughout our Primary and Elementary classrooms, the Montessori maps reflect this awareness and practice in a beautiful way. In Primary, children work with puzzle maps. The initial introduction to the work is presented as a puzzle. Children become confident and aware of the relative position, size, and shape of the continents of the world and the countries of those continents. Later, spoken language is added and finally written language is added in the form of labels. Students also have the option of creating or coloring a paper map of the world or country they are studying. Because the 3 to 6-year-old is learning with an absorbent mind, the names, locations, and orientation of the continents and countries are easily learned and remembered. 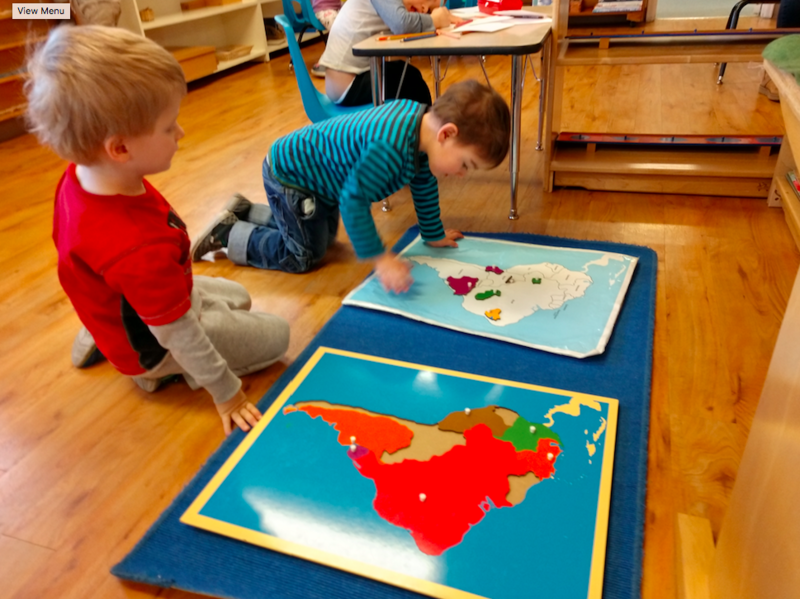 In Elementary, the child moves to the reasoning mind and wants to understand why countries have these shapes and differences, as well as additional details about the areas. This leads to the knowledge that landforms often create borders, that there are political and cultural differences in adjacent countries, and an awareness of how the geography and resources of an area played a significant role in the settling of that region. 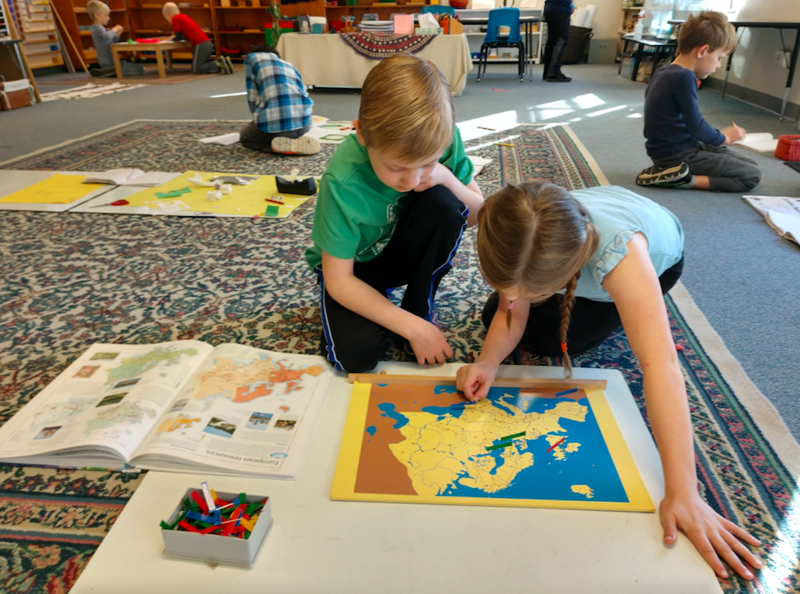 The pin maps offer a more abstract look at world geography with the hope of sparking interest while also exploring different areas of the world. The maps have different colored flag pins that are used to mark rivers, other landforms, large cities, and capitals. This process can require extensive research to discover where these pins should be placed and often inspires additional research on an aspect that sparks the interest of the children working on it. This might range from the question, “Just how big is the Sahara Desert?” to “Why did they call Greenland green when it is mostly ice?” The gift of discovery is a powerful element of the Elementary child’s work and this process supports the development of both a growth mindset and the development of a life-long learner – not to mention an understanding of geography.